England remains the number one destination for golf, with more golf courses and players than any other European country, even trumping Germany by 50,000 golfers. 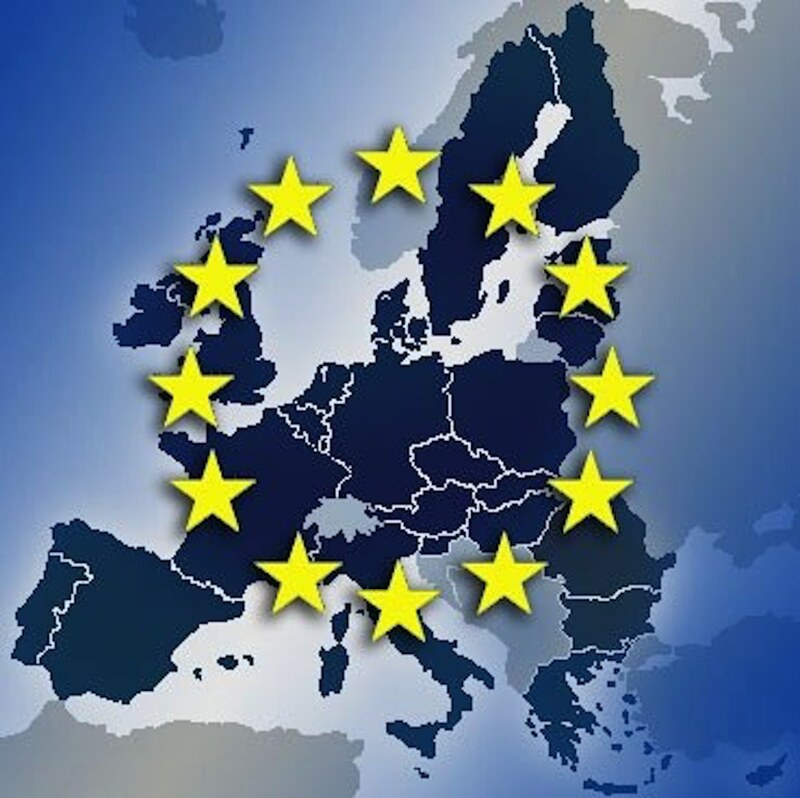 There are 4.1 million registered golfers in Europe, making up 0.9% of the European population; a rise of 2% from the year before. This is partly due to several initiatives promoting inclusion in the sport. Out of all European golfers, 67% are male, 25% are female and 8% are juniors. In comparison, the UK has a far higher proportion of male players; the sixth highest at 80%. Female players make up just 13% of the UK’s golfing community, whilst juniors make up 7%: demonstrating golf remains a heavily male-dominated sport. 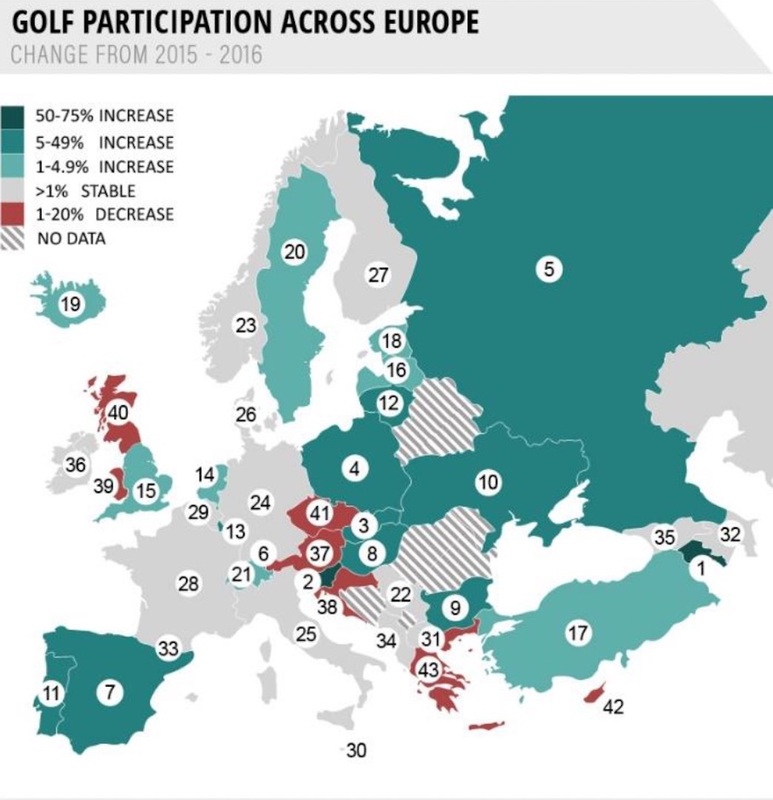 In response to the rise in European golfers and those who participate, UK golfing retailer Golfsupport.com identified the countries with the largest golf participation growth. 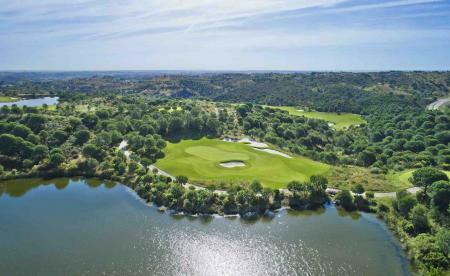 Golfsupport.com had found that 46% of European countries have witnessed a growth in participation, whilst 19% saw a decline. These figures are remarkable compared to the previous year where one third of European countries saw a decline, and only 30% of countries saw growth. 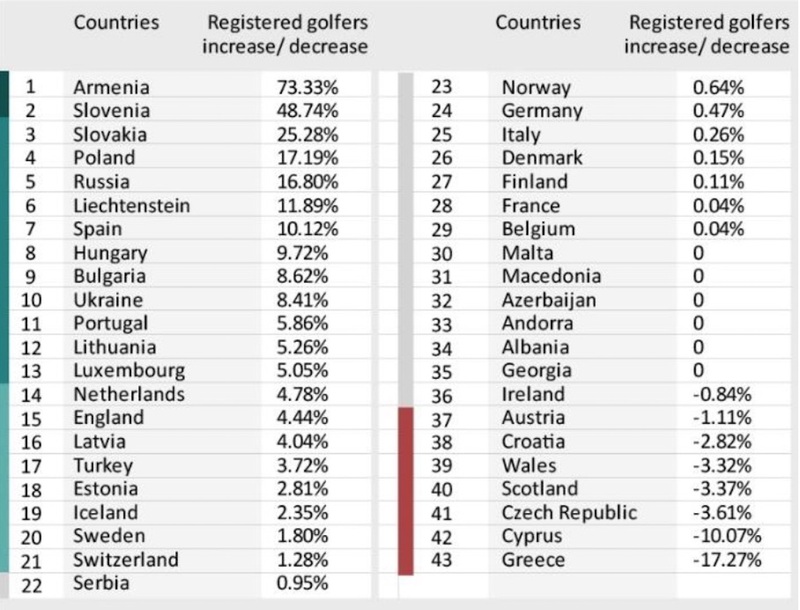 Golfsupport.com had found the countries witnessing the most significant increase in golf participation are Armenia (73.33%), Slovenia (48.74%) and Slovakia (25.28%). Armenia has undergone much campaigning to build popularity for the sport by an enthusiastic group of amateur yet experienced golfers. Earlier this year, the National Golf Association of Armenia became the 151st affiliate of the R&A, which has helped strengthen the game in Armenia and attract interest, along with the economic growth and stability in the country. 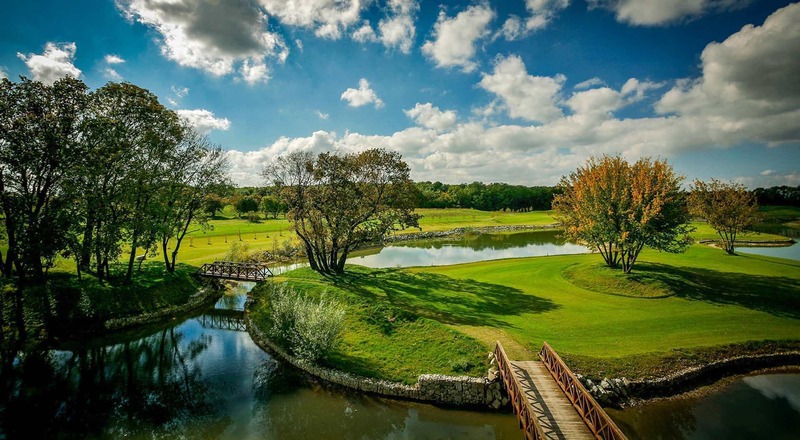 Slovenia has seen an increase in participation as golf is perceived to be a sport that could attract tourism to the country, with its mountainous regions and beautiful courses. The 4.44% increase in the UK could be attributed to several campaigns in boosting participation. 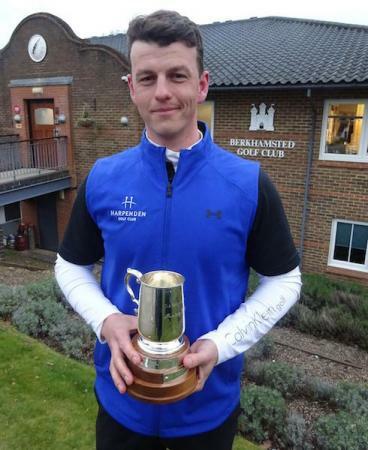 One recent campaign by retailer American Golf supported by England Golf and 1,500 clubs around the UK and Ireland has launched an initiative to offer everyone in the UK three free rounds of golf at their local course and free lessons in their stores with a PGA professional. Scotland saw the biggest decline (19%) in golf courses in the past year, followed by England (16%) and Ireland (4%). Germany and Portugal saw the largest increase (5%). These closures are largely due to a fall in memberships instead seeing an increase in sporadic pay-as-you-go play and clubs subsequently not making enough money to maintain courses to the acceptable standard.